Associated Bank Stocked the Box for the Autism Society of Minnesota (AuSM) with help from Minnesota Wild fans to raise autism awareness. 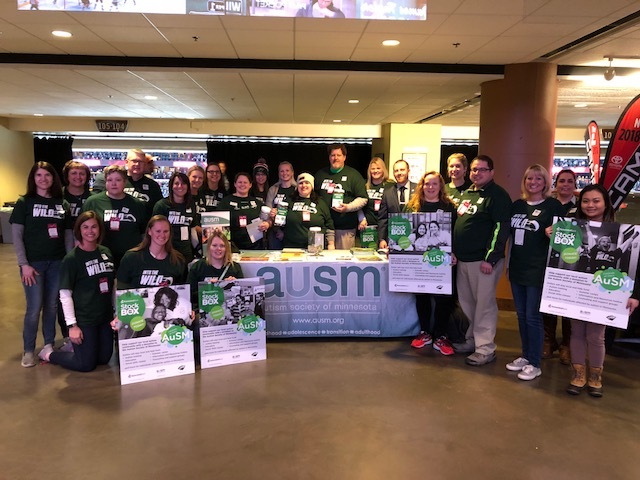 Volunteers from Associated Bank and AuSM were at the March 19th game collecting donations and educating fans on autism and the resources AuSM offers. The event was part of a partnership between Associated Bank, the Minnesota Wild and AuSM that kicked off in January. Autism affects 1 in 68 individuals, which makes autism the fastest growing developmental disability in Minnesota and in the United States. Dollars donated to the Autism Society of Minnesota will stay in Minnesota to support programs and services for our local autism community – all designed to enhance lives. Programs and services include autism training, education, social skills classes, summer camps, an Information and Resources hotline, counseling and support groups, and more for individuals and families affected by autism in Minnesota. If you’re interested in learning more about AuSM, click here to watch a short video.